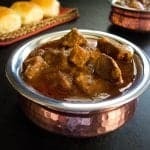 Instant Pot Biryani with Lamb is an aromatic one-pot dish made with basmati rice and lamb and flavored with complex spices and caramelized onions, raisins, and nuts. This biryani recipe is the pressure cooker version of a family recipe for biryani. Serve this Instant Pot biryani with raita (Indian yogurt relish). Many cultures around the world have a version of a rice and meat dish. Biryani (pronounced ‘bir-yah-nee’) is the Indian version of paella, jambalaya, or arroz con pollo i.e. meat, seafood, or vegetables cooked with rice. In my opinion, biryani is one of the most delicious dishes to come from the Indian subcontinent! And it’s one of my favorite dishes; it’s an aromatic one-pot meal that delivers a feast in every bite. My mother-in-law Grace makes the most delicious biryani. 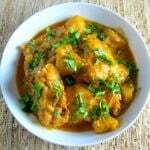 I recently shared her delicious and authentic vindaloo recipe. Her biryani is something that’s made for special occasions because it requires hands-on time, and it cooks slowly on low heat in the oven or on the stovetop. 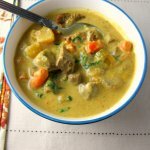 I’ve streamlined the recipe to adapt it to the Instant Pot, and made it much easier, quicker, and simpler. In the process, my husband and kids have had to eat a LOT of biryani, waiting for me to perfect the recipe! How biryani originated in India is up for debate. It may have come from Persia via the Mughal conquerors of India, or its origin could be South India (specifically Kerala, the state my family is from), where Arab traders introduced it. Whatever the origins, I think one thing that we can agree on is that biryani is delicious! Different regions of India have different recipes for biryani. Some recipes have potatoes. Some biryanis are topped with boiled eggs. Rice and meat can be cooked separately. There are vegetarian biryani and fish biryani recipes. Some are spicier than others. You can add green chilies. Or grated coconut. Some biryanis are made without yogurt. Some biryanis are covered with a dough and baked to seal in the flavors. But essentially, biryani is meat, fish or vegetables layered alternately with rice, and cooked slowly to make a delicious one-pot meal. So technically this Instant Pot biryani may not be a true biryani because there is no layering of the basmati rice and meat and it’s not slow cooked. But that’s not why you’re here. You want a simplified version of biryani that’s tasty. So who cares if it’s layered or not, right? Now, I know you have to get out your blender, but please don’t let that stop you from trying out this dish. Just blend, marinate, pressure cook. Pretty straight-forward and easy. But, if you don’t want to blend the ingredients, you could just mix the ingredients together. Be sure to finely chop the ginger, garlic, cilantro, and mint, since they won’t be blended. Although you can get decent results with the Instant Pot, the frying pan is the better option if you want crisp onions. Either way, they take time. 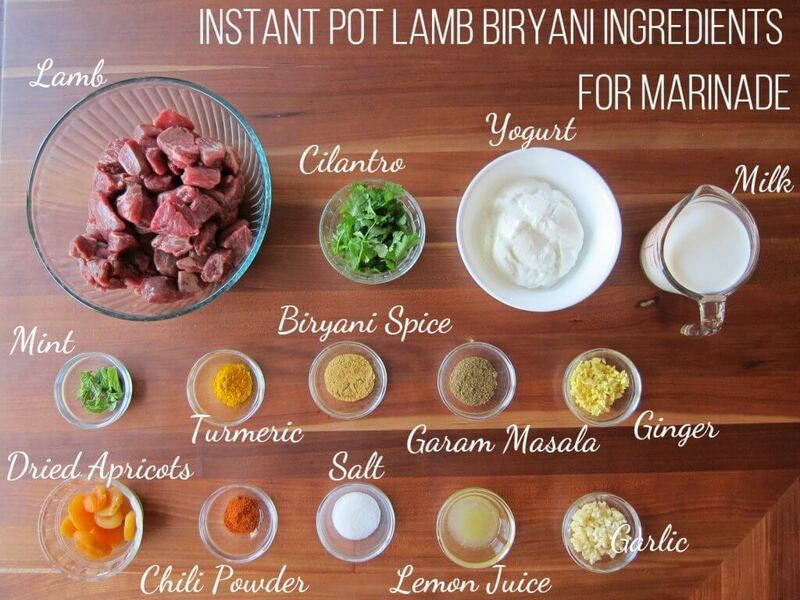 With the Instant Pot, I find that if I plan ahead, I can actually make Instant Pot lamb biryani even on a weeknight. The key is to make the marinade and fry the onions ahead of time and store in the fridge. If you find the onions sticking to the bottom of the pot, deglaze ever often with a tablespoon or two of water. I keep a cup of water to the side that I use occasionally during the frying process. Oh, and although the caramelized onions smell amazing, by the time you’re done frying them, that amazing smell will probably be all over YOU – so, fair warning! – Before beginning pressure cooking, make sure you deglaze the inner pot so there’s nothing stuck to the bottom or you can have trouble with the Instant Pot pressurizing. 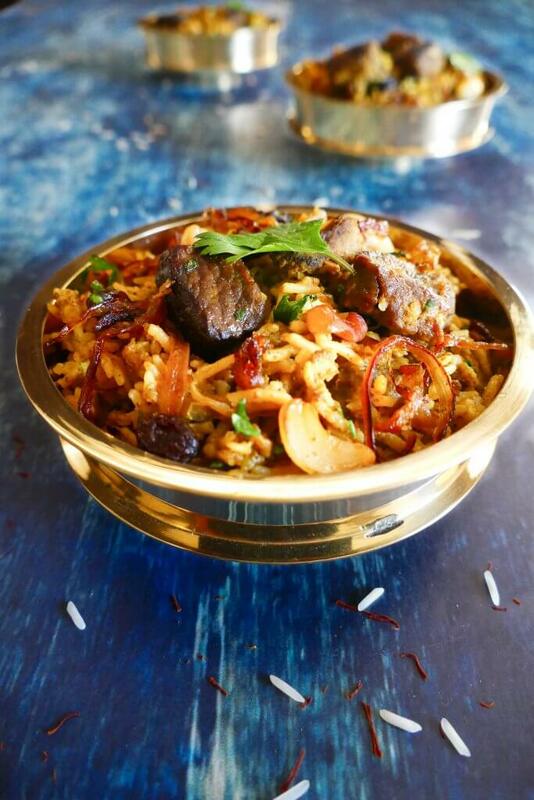 – Although I prefer to marinate the meat for this Instant Pot lamb biryani, there are times when I don’t plan ahead and I skip the marination. Things happen, and sometimes you do what you can! It still turns out quite tasty. Grind in a coffee grinder or mix powders together and store in a cool dry place. The aroma is heavenly!! 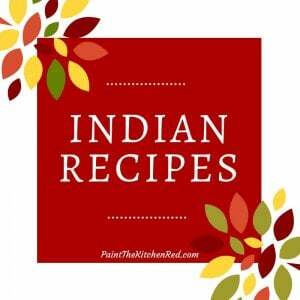 – To make the Instant Pot biryani more spicy, add a chopped jalapeno when you’re pressure cooking the lamb. You could also increase the quantity of chili powder. – When you’re adding the rice to the gravy, don’t stir it in. Just pour the washed rice in, and gently spread out and press down with a spatula to make sure the gravy covers the rice. 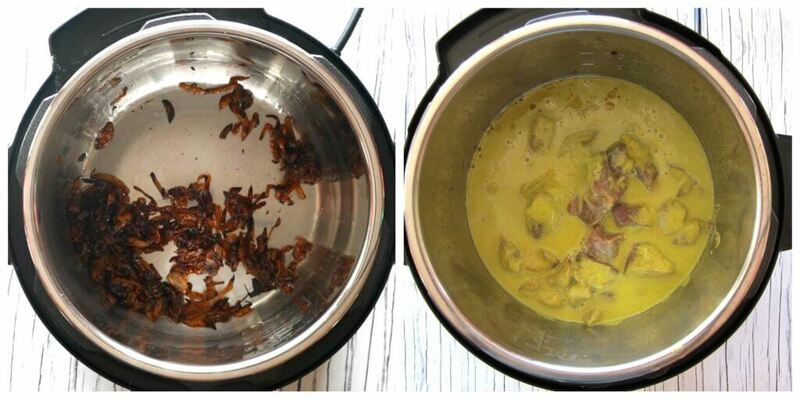 – If you’d like to make Instant Pot chicken biryani, use skinless, bone-in chicken legs and thighs instead of lamb, pressure cook for 6 to 8 minutes, and then proceed with the biryani recipe as written. If you’re new to the Instant Pot and aren’t familiar with how to use it, please read the Instant Pot DUO Beginner’s Quick Start Guide or the Instant Pot ULTRA Beginner’s Quick Start Guide first and then come back here to learn how to make Instant Pot Biryani. 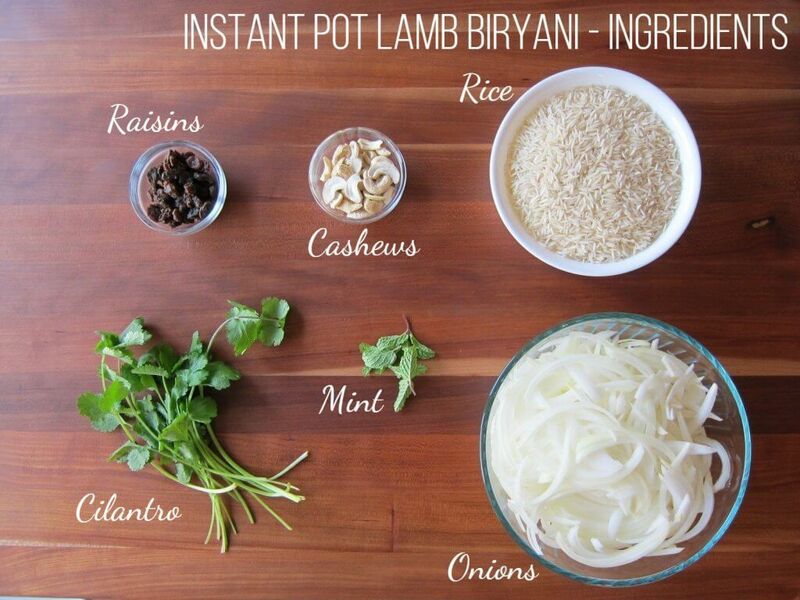 Read on for ingredients and step by step instructions for how to make Instant Pot Lamb Biryani. Blend half the milk, all the yogurt, turmeric, biryani spice, garam masala, chili powder, salt, lemon juice, dried apricots, ginger, and garlic. Optional: WHITE poppy seeds (not black). Add cilantro, mint, remaining milk and blend some more, until smooth. Transfer sauce and lamb to a medium bowl. Refrigerate for 2 to 8 hours. Once the Instant Pot heats up, add ghee or oil to the Instant Pot inner pot. Add sliced onions to the ghee. Cook the onions until they are caramelized, but not burnt! This can take 20 to 30 minutes. * Note: if you increase the Saute temperature to High or More, make sure you’re keeping a close eye on the onions. If the onions begin sticking to the bottom, deglaze occasionally with a tablespoon or two of water or broth. It will take a long time to get the onions to be crisp and completely caramelized as shown above. * Note: You can probably fry the onions faster on the stovetop if that’s an option for you. Add more ghee or oil to the Instant Pot if necessary. Add raisins and fry until they puff up. Remove with a slotted spoon, and set aside. Add cashews and fry until they’re golden brown. Remove with a slotted spoon and set aside. Deglaze the inner pot with a couple of tablespoons of water so there’s nothing stuck on the bottom of the inner pot. Add back in half the fried onions. Add in the lamb and marinade. Add in water and stir. Press ‘Manual’ (or ‘Pressure Cook’) and ‘+’ or ‘-‘ until display reads ‘12′ (12 minutes). Select Pressure Cook mode and adjust time to 12 minutes (00:12). Press down with a spatula so the liquid covers the rice, but don’t stir. 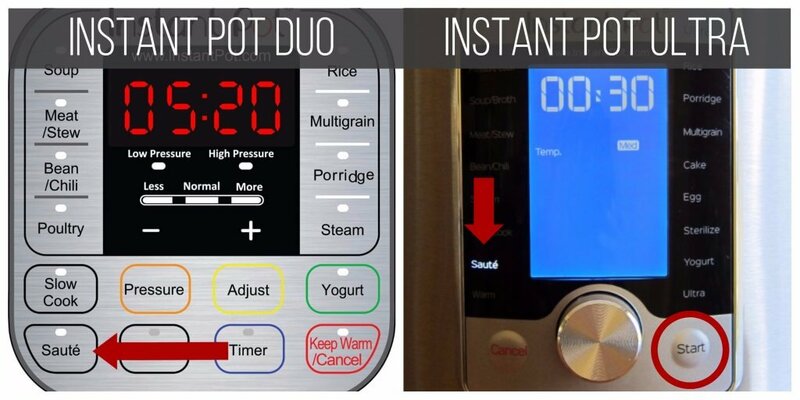 * It’s important that you don’t stir the rice or you could have issues with the Instant Pot not coming to pressure. Select Pressure Cook mode and adjust time to 5 minutes (00:5). Wait till the count-up timer reads 00:10 or L0:10 (10 minutes) and release any remaining pressure manually as described in the quick release section above. Let the biryani rest for about 10 minutes and sprinkle remaining fried onions, raisins, cashews, cilantro and mint. Instant Pot Lamb Biryani is an aromatic one-pot dish made with basmati rice and lamb. Flavored with complex spices, it is topped with caramelized onions, raisins, and nuts. One of my favorite recipes, it's the pressure cooker version of a family recipe for biryani. A feast in every bite! Blend half the milk, all the yogurt, turmeric, biryani spice, garam masala, chili powder, salt, lemon juice, dried apricots, ginger, garlic and white poppy seeds. Add cilantro, mint, remaining milk and blend some more, until marinade is smooth. Stir together lamb and marinade in a medium bowl, and refrigerate for 2 to 8 hours. 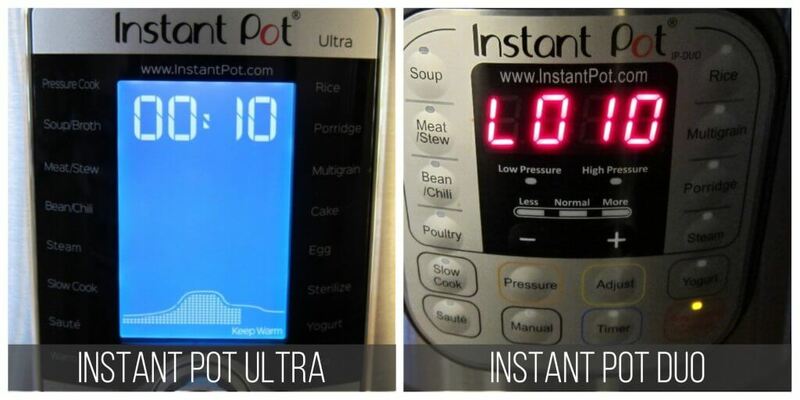 Heat the Instant Pot in 'Saute' mode, and add oil or ghee to the Instant Pot inner pot when it’s hot. Add sliced onions and fry the onions until they are caramelized and brown, but not burnt! This can take 20 to 30 minutes. Remove onions with a slotted spoon, and set aside. Add raisins and fry until plump (add more ghee or oil if needed). Remove with a slotted spoon, and set aside. Press Cancel to turn off the Instant Pot and deglaze the inner pot with a couple of tablespoons of water so there’s nothing stuck on the bottom of the inner pot. Add back half the fried onions to the inner pot. Add in the lamb with marinade. Pour water into bowl that lamb was marinated in, and swirl around to pick up any remnant marinade. Pour water into inner pot and stir to combine. Close the Instant Pot and pressure cook for 12 minutes. Do a Quick Release (QR) and open the lid. Rinse the rice and add to the Instant Pot. DON'T stir, but press down into the gravy. Close the lid and pressure cook for 5 minutes. Do a 10 minute Natural Pressure Release (NPR) i.e. wait for 10 minutes and release any remaining pressure. Open the Instant Pot and stir up the biryani carefully. If the onions begin sticking to the bottom, deglaze occasionally with a tablespoon or two of water. Onions may also be cooked on the stovetop, in a frying pan. It’s important that you don’t stir the rice when you add it to the Instant Pot, or you could have issues with the Instant Pot not coming to pressure. Just press down to cover with liquid. See the blog post for more detailed recipe tips, including homemade garam masala. Easter is coming up soon and your Instant Pot is the perfect kitchen appliance to help you create a mouthwatering Easter feast. This Instant Pot Lamb Biryani is just one choice. I’ve teamed up with a talented group of food bloggers to give you some more wonderful Instant Pot Easter recipes! Just reading this recipe I can smell all the wonderful spices and the creamy (make my own) yogurt……can not wait to try this. I love your recipes so much. As I tell people don’t be afraid to use SPICES…..I don’t think a lot of cooks know…….there us much more than salt pepper and garlic!!!!! Hi Patsy! I hope you enjoy the recipe. Some biryanis are mild, but this one has lots of flavor. You’re so right; spice does not necessarily mean hot, just flavorful! Thank you so much for taking the time to comment! 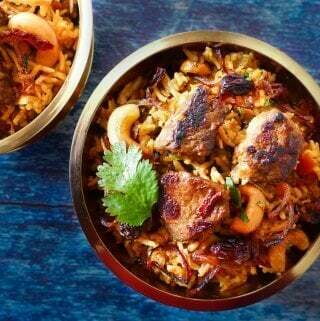 This biryani looks so amazing! I am going to try it with chicken drumsticks and thighs, and marinate it for 2 hours. Will that be sufficient? I was wondering what the apricots do – do they add a bit of sweetness to the marinade? If the apricots are large, how many should I use? Hi Dhanya – yes, I think 2 hours is good. The dried apricots add a sweet/sour flavor but you can also leave them out. I think 1/2 cup or so should be good. I use prunes sometimes. Thanks Neena, will let you know how it turns out! This looks so delicious and flavorful! Can’t wait to make it! I hope you get to try it out soon, Anna. Just made this last night for friends. It was lovely and easy. Prep in the morning and then marinate all day. Throwing it together in the instant pot was so easy. The rice with it turned out really well too. I was worried that it wouldn’t be thoroughly cooked but not problems there. The lamb was so tender and delicious and the blend of spices was just great. I don’t like it too spicy so I cut back on the hot chili a bit and it was just perfect. Thank you for sharing. The pictures and steps make it look a lot more complicated than it was. I am a regular instant pot user so maybe that helped but I found it to be quite easy and simple. Especially starting with just loading everything into the blender and letting it run for a minute or two. Love my instant pot and my vitamix. Thanks for sharing. Thanks, Kathleen! I’m glad you found it to be easier than you expected, that’s good to know! Sometimes the number of ingredients can make a recipe seem more complicated than it really is! I tried this recipe yesterday with bone-in chicken. Thanks for including the pressure cook timings for chicken. It was much easier than traditional biryani recipes i’ve seen before! I used ghee this time, and maybe I will try next time with a good veg. oil. The one thing about using bone-in chicken was that I felt the marinade needed more salt, because the chicken pieces are quite big, and I used abt 2.5 lbs of chicken in all. I blended in one Serrano green chili to the marinade, and I think I could use one more the next time. ? Thanks Neena for a great family recipe! Awesome, Dhanya. I love bone-in chicken. Thanks for the details and tips, especially about salt. I made this but the Instant Pot didn’t seal. One major change I made was marinating it for a full day, not the 2-8 hours the recipe called for. Did that make the sauce too thick resulting in the sealing issues. Also, why are steps #1 and #2 separate? Why not put everything in the blender and blend at once? Hi Albert, thanks for your questions. Steps 1 and 2 are separate because I find that if I grind everything together in a basic blender, the paste is more grainy. If you have a really powerful blender, you might be okay doing everything together. I don’t think that marinating overnight would have made a difference in sealing. 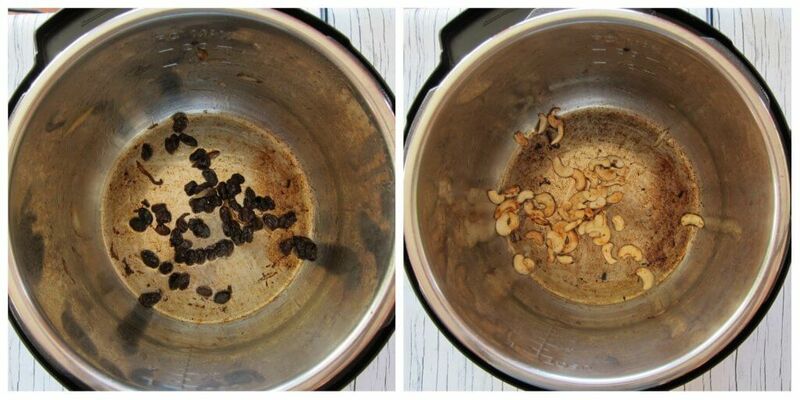 It could be the type of Instant Pot you’re using requires you to have more liquid. You could try adding 1/4 cup of water or broth to the inner pot, then add the marinade and meat before pressure cooking. Naila, I’m so happy to hear you like the recipe – I too love making this recipe. I actually have some lamb already cut up in my freezer to make this next week!